Aim: The study aimed at investigating in vitro antimicrobial activity of ethanolic extract of propolis (EEP) and water extract of propolis against two main cariogenic oral pathogens: Streptococcus mutans and Lactobacillus acidophilus. Material and Methodology: Propolis was obtained from beehives in the Jhabua region of India. Ethanolic and water extracts were prepared at concentrations of 5% and 20% weight/volume (w/v). To support the results, a positive control (chlorhexidine 0.2%) and a negative control (distilled water) were used. S. mutans was cultured on brain–heart infusion agar and L. acidophilus was cultured on De Man, Rogosa, and Sharpe agar. Results: The results showed that at concentrations of 5% and 20%, EEP was effective against S. mutans and L. acidophilus. However, at similar concentrations, water extract was effective only against L. acidophilus. The highest activity was shown by chlorhexidine (0.2%) with mean zones of inhibition of 13.9 mm and 15.1 mm against S. mutans and L. acidophilus, respectively. Conclusion: It can be concluded that the propolis extracted from tribal regions of Jhabua possesses antibacterial efficacy against S. mutans and L. acidophilus. Dental caries, if left untreated, can lead to pain, infection, tooth loss and may affect quality of life. It is a multifactorial disease of microbial origin. Of 300 species inhabiting the dental plaque, Streptococcus mutans and Lactobacillus acidophilus are the two most important agents of dental caries. Dental caries can be prevented by the use of good oral antiseptics which should possess certain important properties, including (1) an ability to interfere with one or more steps of caries development, (2) non-toxicity to host cells, and (3) lasting residual activity. Furthermore, it is essential that the product does not cause a significant imbalance in the oral microbiota. Antimicrobials such as chlorhexidine and triclosan are in use for the control of microorganisms causing caries. However, the use of chemical products is associated with side effects such as altered taste perception and yellow-brown staining on dental hard tissue, restorative material surfaces, and the tongue.,,, Therefore, there is a need for natural antibacterial compound which can be safely used to prevent occurrence of dental caries. Hence, propolis extract from the unexplored Jhabua tribal regions of Madhya Pradesh (MP), India, was considered. The rationale of the study was to evaluate the antimicrobial effect of propolis extracted from beehive which was obtained from Jhabua tribal region of MP against two main cariogenic oral pathogens S. mutans and L. acidophilus and found that at concentrations of 5% and 20%, the ethanolic extract of propolis (EEP) was effective against S. mutans and L. acidophilus. The study was conducted in the Department of Public Health Dentistry in Sri Aurobindo College of Dentistry. The ethical clearance was obtained from Institutional Ethical Research Committee. Beehive which was procured freshly from Jhabua tribal regions of MP was dissolved in 250 ml of 99% ethanol by 150 rpm orbital shaking at 25°C for 48 h. The resultant extract was then filtered through Whatman no. 4 filter paper and restored to its original volume by adding 80% ethanol. The filtrate in liquid condition was placed in vacuum evaporator for 8 h. This resulted in brownish dark resinous propolis extract. The extract was stored in cool dry place. The required concentrations of 5% and 20% ethanolic extract were prepared by adding 0.5 g and 2.0 g of propolis in 10 ml of ethanol, respectively. Similarly, for water extract, the same amount was added in distilled water. Test organisms S. mutans (Microbial Type Culture Collection [MTCC] 890) and L. acidophilus (MTCC 447) were obtained from MTCC Gene Bank, Institute of Microbial Technology, Chandigarh, India. The bacteria were obtained in lyophilized form in a glass vial. The lyophilized L. acidophilus was revived by transferring to simple nutrient broth which was prepared in laboratory by adding peptone 1%, yeast extract 0.3%, NaCl 0.5%, and water 100 ml and incubating at 37°C for 48 h. In case of S. mutans, sugar-enriched nutrient broth was used in which 0.5% pure crystalline glucose was also added. After 48 h, turbidity of broth indicated the revival of microorganisms. Identification of bacteria was done based on colony morphology, and confirmation was done by Gram staining. The antibacterial activity of guava extracts was checked by agar well-diffusion method. Antibacterial testing was carried out in laminar airflow to avoid contamination by other organisms. Two groups of plates, viz. ethanolic extract group and water extract group, were prepared for both the bacteria. The assay was performed on 10 plates in each group. To perform antimicrobial assay for S. mutans, 0.5 ml of suspension of inoculums having 3 × 108/ml of S. mutans was streaked on brain–heart infusion (BHI) agar. The antibacterial activity of propolis extracts was assessed by agar well-diffusion method. Two groups of plates, namely ethanolic extract group and water extract group, were prepared. Similarly, 0.5 ml of inoculums containing 3 × 108/ml L. acidophilus was streaked on De Man, Rogosa, and Sharpe (MRS) agar. Four wells were prepared on each plate with well borer. The plates of ethanolic extract group were carefully filled with 0.08 ml each of 5% EEP, 20% EEP, 0.2% chlorhexidine (positive control), and sterile distilled water (negative control). Similarly, each plate of water extract group was filled with 5% water extract of propolis (WEP), 20% WEP, 0.2% chlorhexidine (positive control), and sterile distilled water (negative control). The plates were kept in refrigerator for 10 min to allow for the diffusion of extracts placed in the wells into the agar. Plates were then incubated at 37°C for 48 h.
The zone of inhibition formed around the wells was measured and reported. Descriptive and inferential statistics such as unpaired t-test and ANOVA were employed to compare between the groups. P < 0.05 was considered statistically significant. The present study was conducted to assess the efficacy of propolis extract against S. mutans and L. acidophilus using agar well-diffusion method. Two types of extracts, i.e., ethanolic and water extracts, were tested at concentrations of 5% and 20%. To substantiate the results, a positive control (chlorhexidine 0.2%) and a negative control (distilled water) were used. The results of present study indicated that both the concentrations of the EEP inhibited the growth of S. mutans as well as L. acidophilus. The mean diameter of zone of inhibition seen against S. mutans was 10.4 mm at 5% concentration and 12.4 mm at 20% concentration [Table 1]. WEP did not show any activity against S. mutans, whereas it had shown very little activity against L. acidophilus. Mean zone of inhibition produced at 5% concentration was 4.4 mm and at 20% concentration was 7.1 mm. The highest antibacterial was activity was seen in 0.2% chlorhexidine with mean zones of inhibition of 13.9 mm and 15.1 mm against S. mutans and L. acidophilus, respectively. The antibacterial efficacy of 20% EEP against S. mutans was significantly better than that observed for 5% EEP (P< 0.01) but lower than 0.2% chlorhexidine (P< 0.05). However, the antimicrobial activity against L. acidophilus of 20% EEP and 0.2% chlorhexidine were similar (P > 0.05) [Table 1]. 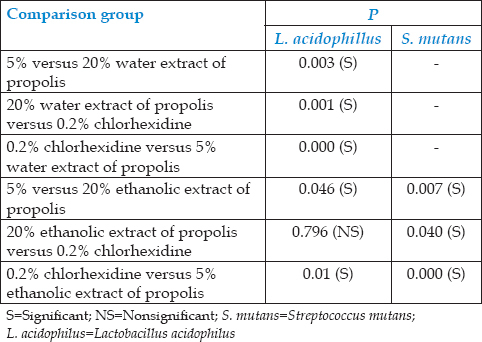 The WEP exhibited no effect against S. mutans but against L. acidophilus; significant efficacy was seen at 5% and 20% concentration (P< 0.05) [Table 2]. 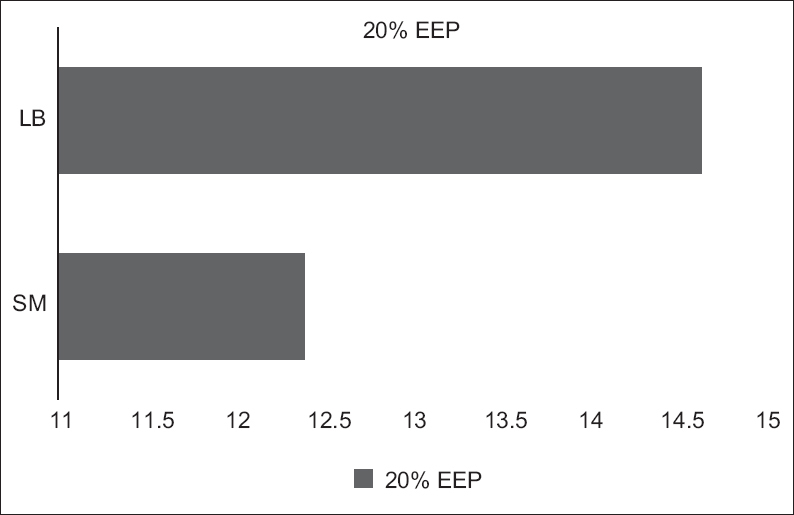 EEP at 20% was statistically more effective on L. acidophilus (14.65 mm) than S. mutans (12.4 mm) (P = 0.00). Comparisons made between medium of extract showed that propolis was more effective in ethanolic medium than water medium [Figure 1]. Dental caries is one of the most common oral diseases worldwide. One approach to reduce the incidence of tooth decay is to develop therapeutic agents aimed at preventing the formation of plaque matrix. It is well documented that the bacteria of the genera Streptococcus, Lactobacillus, Fusobacterium, Corynebacterium, and Staphylococcus are normal flora of mouth and can also cause dental caries. The propolis from the tribal region of Jhabua (MP) is unexplored. The chemical composition of propolis is complex and it depends on geographic area from where it is collected. Propolis has a complex chemical composition of resin (50%), wax (30%), essential oils (10%), pollen (5%), and other organic compounds (5%). Organic compounds present in propolis include phenolic compounds and esters, flavonoids in many forms (flavonols, flavones, flavanones, dihydroflavonols, and chalcones), terpenes, beta-steroids, aromatic aldehydes and alcohols, sesquiterpenes, and stilbene terpenes. The antibacterial activity possessed by propolis has been attributed to these components. However, most of the biological activity is contributed by flavonols. Flavonols are found to be effective against many bacteria including S. mutans and L. acidophilus. The composition of propolis depends on the species of honeybees and type of vegetation in that geographical region. Propolis from Europe, China, and North America contain flavonoids and phenolic acid esters, whereas Brazilian propolis contain terpenoids. A new prenylated flavonoid was seen in Japanese propolis. The present study evaluates the efficacy EEP and WEP against S. mutans and L. acidophilus at 5% and 20% concentration. Although the minimum inhibitory concentration (MIC) of propolis against S. mutans reported was in the range of 4–512 μg/ml, the MIC value shown by EEP was 200–400 μg/ml and for L. acidophilus. This study was done at higher concentrations of 5% and 20% as this was preliminary study to know whether propolis from Jhabua is having antimicrobial activity against S. mutans and L. acidophilus. Further research is needed to know the MIC of propolis (obtained from Jhabua) against these two bacteria. The culture medium used for the growth of bacteria was in accordance with the recommendations given by MTCC, Chandigarh, from where the bacteria were obtained. MRS agar for L. acidophilus and BHI agar for S. mutans were employed. Previous studies also suggest BHI agar for recovery of dental pathogens from clinical specimen.,,, Agar well-diffusion method was employed for bioassay as it is reported to give better results than other methods such as agar disc-diffusion method. Clear zone of inhibition of 10.4 mm (±1.32 mm) and 12.4 mm (±1.46) was seen on BHI agar with 5% and 20% EEP against S. mutans. This effect was comparatively less than that of 0.2% chlorhexidine with mean zone of inhibition of 13.9 mm (±1.21). Similar findings were reported by Libério et al., showing an inhibition zone ranging from 9.0 to 13.0 mm for S. mutans. Ophori  reported higher zone of inhibition of 24 ± 4 mm against S. mutans at concentration of 32 μg/ml and 6 ± 2 mm at concentration of 2 μg/ml of propolis. Park et al. compared ethanolic extracts of different regions keeping 80% ethanol as control, and also, this study concluded that 80% ethanol by itself was not the cause for antibacterial activity against S. mutans. In the present study, propolis was effective against S. mutans only in ethanolic medium but not with water extract. Jafarzadeh Kashi et al., also have reported that the water extract of Iranian propolis demonstrated only slight activity against S. mutans at concentration of 20 mg/ml, and ethanolic extract was more effective than water extract. One of the limitations of the study was that in ethanolic group, ethanol was not used as negative control, and thus, the individual contribution of propolis extract and ethanol toward antibacterial activity of ethanolic extract cannot be determined. EEP at concentrations of 5% and 20% showed inhibition zone of 12.7 mm (±2.08 mm) and 14.65 mm (±1.65), respectively, against L. acidophilus. The antibacterial efficacy of 20% EEP on L. acidophilus was similar to that of 0.2% chlorhexidine. Libério et al. have reported that there is no activity of hydroalcoholic extract of propolis against L. acidophilus. The WEP was effective on L. acidophilus even though there were no results against S. mutans. The propolis extract from Jhabua (MP) region used in the study has shown good higher antimicrobial activity against L. acidophilus as compared to S. mutans. Contrary to our findings, the results of study done by Elbaz and Elsayad  showed that the EEP had a strong antimicrobial effect against S. mutans as compared to L. acidophilus at lower MIC. The present study was a qualitative assessment of antibacterial activity of propolis. Determination of MIC and the optimum inhibitory concentration for the same is recommended. The findings can form the basis for future studies to isolate active compounds and to evaluate antimicrobial potential of the propolis against other bacteria present in dental plaque. There is need to investigate the in vivo antibacterial activity of the extracts and their efficacy in preventing dental decay. Although natural products are considered safe to use, any side effects with the use of EEP in mouth rinse or toothpaste should be studied. Propolis extracted from Jhabua, a tribal region of India, possesses antibacterial effect on cariogenic bacteria. At concentrations of 5% and 20%, the EEP was effective against S. mutans and L. acidophilus. The antibacterial effect of EEP against L. acidophilus was comparable to 0.2% chlorhexidine, although weaker against S. mutans. Water extract at similar concentrations was effective only against L. acidophilus. We would like to thank Dr. Sheetal Bhasin (Professor and Head) and Miss Bhagyashree Talrekar, Department of Biosciences, Maharaja Ranjeet Singh College, Indore, for their support in microbiological procedures. We also acknowledge the support of Mr. Suresh Airen (Principal) of Devi Ahilya College of Pharmacy, Indore. Limsong J, Benjavongkulchai E, Kuvatanasuchati J. Inhibitory effect of some herbal extracts on adherence of Streptococcus mutans. J Ethnopharmacol 2004;92:281-9. Kuropatnicki AK, Szliszka E, Krol W. Historical aspects of propolis research in modern times. Evid Based Complement Alternat Med 2013;2013:964149. Handa A, Hegde N, Mahendra S, Mahesh CM, Ramesh PC, Soumya KM. Propolis and its potential in dentistry: A review. Int J Health Sci Res 2012;1:143-7. Parolia A, Thomas MS, Kundabala M, Mohan M. Propolis and its potential uses in oral health. Int J Med Med Sci 2010;2:210-5. Viuda-Martos M, Ruiz-Navajas Y, Fernández-López J, Pérez-Alvarez JA. Functional properties of honey, propolis, and royal jelly. J Food Sci 2008;73:117-24. Park YK, Koo MH, Abreu JA, Ikegaki M, Cury JA, Rosalen PL, et al. Antimicrobial activity of propolis on oral microorganisms. Curr Microbiol 1998;36:24-8. Libério SA, Pereira AL, Araújo MJ, Dutra RP, Nascimento FR, Monteiro-Neto V, et al. The potential use of propolis as a cariostatic agent and its actions on mutans group streptococci. J Ethnopharmacol 2009;125:1-9. Helms JA, Della-Fera MA, Mott AE, Frank ME. Effects of chlorhexidine on human taste perception. Arch Oral Biol 1995;40:913-20. Barrientos L, Herrera CL, Montenegro G, Ortega X, Veloz J, Alvear M, et al. Chemical and botanical characterization of Chilean propolis and biological activity on cariogenic bacteria Streptococcus mutans and Streptococcus sobrinus. Braz J Microbiol 2013;44:577-85. Salatino A, Teixeira EW, Negri G, Message D. Origin and chemical variation of Brazilian propolis. Evid Based Complement Alternat Med 2005;2:33-8. Kumazawa S, Ueda R, Hamasaka T, Fukumoto S, Fujimoto T, Nakayama T, et al. Antioxidant prenylated flavonoids from propolis collected in Okinawa, Japan. J Agric Food Chem 2007;55:7722-5. Ophori EA, Eriagbonye BN, Ugbodaga P. Antimicrobial activity of propolis against Streptococcus mutans. Afr J Biotechnol 2010;9:4966-9. Koo H, Rosalen PL, Cury JA, Park YK, Bowen WH. Effects of compounds found in propolis on Streptococcus mutans growth and on glucosyltransferase activity. Antimicrob Agents Chemother 2002;46:1302-9. Selvan AK, Singh R, Prabhu T. Antibacterial activity of bee propolis against clinical strains of Streptococcus mutans and synergism with chlorhexidine. Int J Pharm Stud Res 2011;2:85-90. Koru O, Toksoy F, Acikel CH, Tunca YM, Baysallar M, Uskudar Guclu A, et al. In vitro antimicrobial activity of propolis samples from different geographical origins against certain oral pathogens. Anaerobe 2007;13:140-5. Hayacibara MF, Koo H, Rosalen PL, Duarte S, Franco EM, Bowen WH, et al. In vitro and in vivo effects of isolated fractions of Brazilian propolis on caries development. J Ethnopharmacol 2005;101:110-5. Jafarzadeh Kashi TS, Kasra Kermanshahi R, Erfan M, Vahid Dastjerdi E, Rezaei Y, Tabatabaei FS, et al. Evaluating the in-vitro antibacterial effect of Iranian propolis on oral microorganisms. Iran J Pharm Res 2011;10:363-8. Elbaz GA, Elsayad II. Comparison of the antimicrobial effect of Egyptian propolis vs. New Zealand propolis on Streptococcus mutans and lactobacilli in saliva. Oral Health Prev Dent 2012;10:155-60.